What changes will make the 2018 Subaru Forester different? Very few, since it’s coming off a model-year 2017 refresh and headed for a complete model-year 2019 redesign. That leaves the 2018 edition of this compact crossover likely treading water, with some new color choices and maybe a special trim treatment to sustain interest in the final year of its design generation. 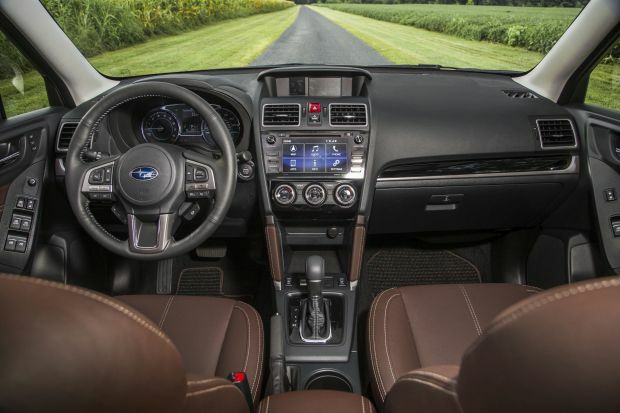 Nonetheless, it’s apt to remain Subaru’s best-selling vehicle, positioned in the automaker’s crossover lineup below the midsize Outback and as the more family-oriented alternative to the similarly sized Crosstrek. Maybe not, considering it’ll be a virtual rerun of the ’17 model. It will, however, almost certainly cost more, thanks to model-year price escalation. Subaru could draw the curtain on Forester’s 2014-2018 design generation by adding a unique trim level that combines popular elements of other models and tacks on some appearance exclusives, such as contrasting body accents. But the ’18 will otherwise reprise the same unsexy but deceptively roomy body, reliable powertrains, and standard all-wheel-drive that have endeared Forester to legions of loyal owners. Choosing an ‘18 sets you up for year-end clearance sales as dealers purge inventories to make way for the all-new ‘19s. Yes, you’d be spending money on a design about to be retired. 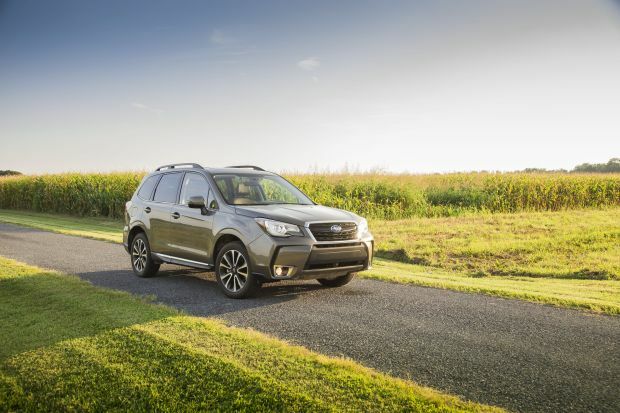 But if you plan to keep your Forester for many years, as lots of owners do, that might be a way to stretch your dollar. Yes, if you’re in tune with its rational approach to versatile transportation. You’d still be two model years away from the full redesign, so styling and features will have a reasonable shelf life. And you’d be getting a Forester updated for model-year ’17 with tweaked styling, improved driver-assist features, and greater refinement. Most buyers go with the 2.5i line, defined by its naturally aspirated 2.5-liter four-cylinder engine and consisting of Base, Premium, Limited, and top-line Touring trim. The more expensive 2.0XT line has a turbocharged 2.0-liter four-cylinder and comes in Premium and Touring grades. In a class of rivals that includes the Honda CR-V, Toyota RAV4, Ford Escape, Nissan Rogue, and Mazda CX-5, the Forster alone features all-wheel drive (AWD) as standard equipment on every model. Only by virtue of newly available paint colors or addition of a special trim version. The ’18 Forster will otherwise continue to look much like an enlarged compact wagon – a shape that disguises the fact it has more passenger and cargo room than the CR-V, RAV4, Escape, Rogue, and CX-5. It’ll carry over the model-year 2017 facelift that gave it a slightly more substantial look, thanks to a reshaped bumper, grille, and headlights in front and new LED taillights. The 2.0XTs will again be distinguished by more aggressive air intakes and unique, tinted alloy wheels that are 18-inches in diameter, versus 17s on the 2.5i models. The ’18 Foresters will also carry over the improved steering wheel design and the noise-attenuation measures that brought needed improvements in cabin quietness. Not until the 2019 redesign, when Forester will move to Subaru’s new modular understructure making its debut on the automaker’s redesigned 2017 Impreza compact car. It’ll be a larger, lighter, more rigid platform for the next Forester’s all-new body. Meantime, the ’18 will carryover with a pair of proven four-cylinder engines, both employing Subaru’s center-of-gravity-lowering horizontally opposed cylinder layout. The 2.5i models should return with 170 horsepower and 174 pound-feet of torque. Base and Premium 2.5i versions should again come with manual transmission. Optional would be the continuously variable automatic transmission (CVT) that’s standard on the Limited and Touring trims. The sportier, turbocharged 2.0XTs should again have 250 horsepower and 258 pound-feet of torque and continue with the CVT only — although with steering-wheel paddles to facilitate manual-type ratio control. They’ll also return with a handling-tuned suspension. All models will again support their standard AWD system with 8.7 inches of ground clearance, equaled in this segment only by the Jeep Cherokee. Further bolstering Forester’s impressive off-pavement prowess, CVT-equipped models (except the Base 2.5i) will again have Subaru’s X-Mode off-road traction system. EPA ratings ought to repeat, meaning the ’18 Forester should again be competitive even with front-wheel-drive versions of key rivals. In the 2.5i line, ratings should again be 22/29/25 mpg city/highway/combined with manual transmission and 26/32/28 with CVT. Expect the 2.0XT models to again rate 23/27/25 mpg. Premium-octane gas for the 2.0XTs would again be Subaru’s recommendation. Not likely, although a special-trim version could feature, say, select Limited-model features like leather upholstery at a Premium-grade price. Otherwise, the ’18 will benefit from model-year 2017 changes that strengthened Forester’s logical trim-level hierarchy. 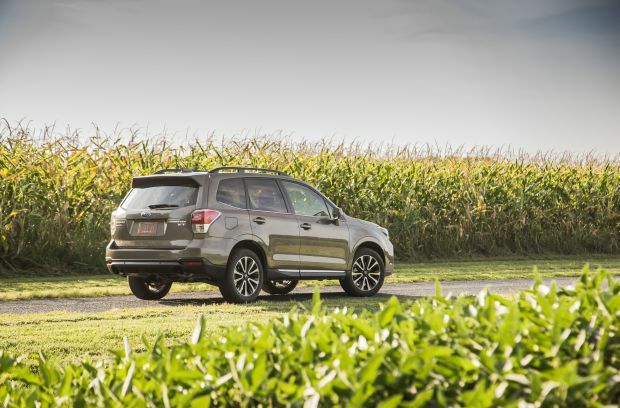 Subaru expanded availability of some desirable items – making a power liftgate available on Premium models, not just Limited and Touring, for example – and introduced Forester firsts, such as an available heated rear seat and heated steering wheel. We’d like to see the brand’s EyeSight driver-assist technology made standard at least on Limited and Touring models. But to Subaru’s credit, the safety system is currently available on every model except the Base 2.5i; many rivals limit such safeguards to their most expensive trims. EyeSight will continue with the upgrades that improved it for ’17, including lane-wander automatic steering correction. On Premium and Touring models, it’ll again bring steering-linked LED headlamps with automatic high-beams. Most significant, EyeSight will again include autonomous emergency braking, which can stop the Forester to avoid a frontal collision. That earns EyeSight-equipped models the industry’s most coveted safety label, Top Safety Pick+ status from the Insurance Institute for Highway Safety. All ’18 Foresters will come with a rearview camera and Subaru’s Starlink infotainment interface for hands-free smartphone linking and streaming. Premium versions should again step up from Base versions with such features as alloy wheels instead of steel rims, plus a panoramic moonroof, a power driver’s seat, and automatic climate control. Look for Limiteds to build on that with standard leather upholstery and body-colored mirrors with integrated turn-signal lamps. Tourings should include all that, plus pushbutton ignition and a high-watt audio system. Bet on some increase, though nothing dramatic, given the segment’s cutthroat competition and the ’18 Forester’s last-of-a-generation status. Standard AWD will again put Forester’s base prices slightly above those of most front-drive compact crossovers, though base prices tend to draw even with similarly equipped AWD rivals. Figure Forester’s strong residuals 0into the value equation, too. Estimated base prices in this review include Subaru’s destination fee, which was $875 on 2017 models. In the 2.5i line, expect Base versions to start around $23,670 with manual transmission and around $24,670 with the CVT. Premiums should begin around $26,590 with manual and around $27,090 with the CVT. Estimated base price is $30,300 for the 2018 2.5i Limited and $32,300 for the Touring. In the 2.0XT line, look for the Premium to start around $30,300 and the Touring around $35,300. Prices of notable options shouldn’t change. For 2017, EyeSight combined with the All-Weather Package was $1,695 on the Premium model; adding the power liftgate made it $2,145. EyeSight can connect with smartphone navigation apps, but an imbedded nav system that doesn’t rely on a cell signal was optional on Limited and Touring. On the Limited, it cost $1,300 in combination with the Harman/Kardon audio upgrade and $2,945 with EyeSight. On a Touring, it cost $1,595 because the audio upgrade is already included. Look for a 2018 Subaru Forester release date during the first half of 2017. A more modern infotainment system with crisper graphics and a faster refresh rate. That, along with other improvements, such as a base ending with the efficiency of direct fuel injection, ought to be part of the 2019 redesign.